On 18 December, IZAR CUTTING TOOLS S.A.L. received a visit from Andrés Zabara, Director of Promotion and Cooperation at the Centre for Industrial Technology Development (CDTI), and Patricia Tamés, Deputy Director of the Foundation for Machine Tool Research (INVEMA). 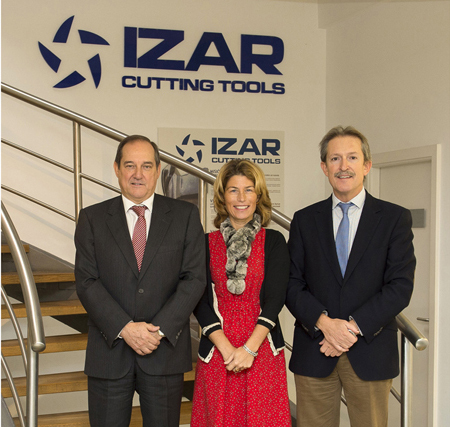 1.- First-hand knowledge about IZAR's cutting tool design, manufacture and distribution activity, which has helped the company to become the leading manufacturer in Spain, also placing it at the forefront of the main European markets. 2.- In line with the institutions' plans, the company's exports have significantly increased in recent years, contributing to Spain's overall growth in exports and playing its part in the country's balance of payments and its economic recovery. 3.- IZAR's commitment, as a social economy company, to manufacturing and employment, which is today more important than ever. 4.- IZAR is currently working on several research projects related to the development of new high performance tools, including participation in EUREKA, a European project with international partners. 5.- As part of the 2014-2016 Strategic Plan, the company intends to continue with its research policy and to develop new products and processes, also making use of the support offered by European funding and collaboration with partners in countries such as Germany, Austria and France. Both Mr Zabara and Ms Tamés were able to discover first hand both its manufacturing processes and the staff members involved in each stage of the project, which they found particularly interesting.